In the third post of my Behind the Scenes of a Free Book Promotion series, I will talk about Promotion Day itself. I set up a spreadsheet to track my downloads throughout the day, much as I had done with my Book Gorilla promotion in 2013. I had plotted a graph with my previous promotions results on it already. For the 2013 promotion, the initial download rate was typical for all my previous free promotions: an almost negligible trickle. Then, when the Book Gorilla email went out soon after 10:00am, for a few hours I got downloads averaging nearly 80 per hour. After that, it started to decay exponentially. By the second day it was back down to a trickle, a averaging less than 10 downloads per hour for the rest of the day. How would the new promotion perform? 5:00am Free Kindle eBooks & Tips puts up their daily blog post. 7:00am There is a slight increase in download rate. 9:16m The Fussy Librarian daily email, and about the same time I note that the EReader New Today blog post is up. There is an increase in download rate. 10:12am BookGorilla daily email. The download rate has been increasing, and it increases a little bit more before steadying at ~120 per hour. This lasts until about 3:30pm. 3:05pm Free Kindle eBooks & Tips daily email. 3:17pm EReader News Today daily email. Due to either Free Kindle eBooks & Tips or EReader News Today or both, there is another increase in download rate to nearly 200 per hour, which lasts until midnight. 10:00am From midnight until 8:00am, the download rate unsurprisingly decreased to about 40 per hour. 8:00am There is a modest increase in download rate, to about 50 per hour, that is remarkably steady throughout the day, and continues to the end of the promotion period. As time ran out on Day 2, I waffled for a bit. My rankings were still very good, but they had already peaked. Should I extend the promotion another day? If the pattern of download rate decreasing after midnight continued, my rate of 50 per hour would probably have declined as well. It might have recovered slightly in the morning, but I doubted that it would do all that well for a third day. In the end I decided to let the promotion end as planned, and I hoped to capitalize on any buzz while the fire was still hot. It would be days before the the aftermath of the promotion took effect. But while I waited to see if there would be any post promotional sales bounce, I could analyze what effect that the advertisers might have had. 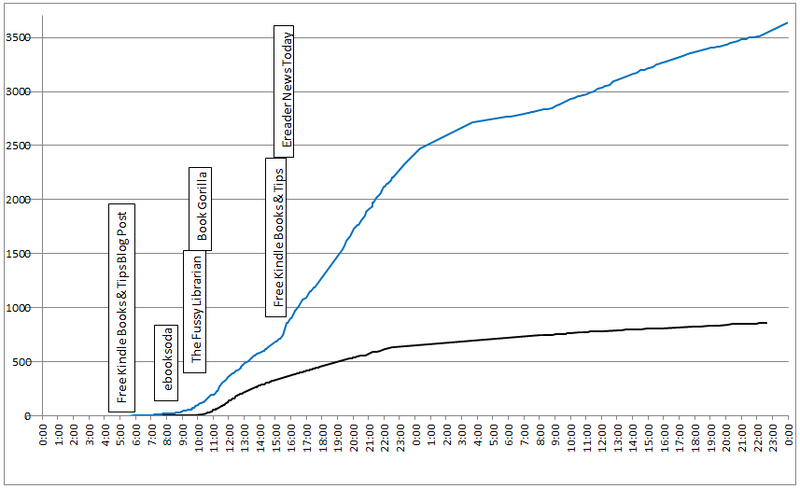 The following is the graph I made during the promotion (click for a larger image). The black line is the number of downloads I received on my 2013 promotion, where I took a single ad out from BookGorilla. The blue line represents the current promotion. The text boxes are placed on the horizontal axis representing when their respective email blasts went out. It is difficult to tell with any certainty just which advertiser had the biggest impact, especially as some of them sent out their emails at the similar times. But from what I can gather, BookGorilla, The Fussy Librarian, Free Kindle Books & Tips, and EReader News Today all appeared to contribute into getting downloads. eBookSoda did not appear to have a significant impact. Booktweeters is even harder to tell, as they sent their tweets out throughout the day. But since I cannot definitively attribute any impact to them, I can’t give them any credit either. In the last post of this series, I’ll talk about the aftermath of the promotion, and whether or not I achieved a return on my investment.